Hanukkah is not considered a “major” Jewish holiday but has been elevated to that status because every year it comes within days or weeks of Christmas. Hanukkah lasts for eight days and this year the first night begins at sunset on December 2 and ends at sunset December 10. Hanukkah in this country has been “Americanized” so the children growing up in homes that do not celebrate Christmas can still participate in the holiday spirit, particularly gift giving and receiving. Therefore, it is traditional to exchange gifts each of the eight nights, starting off small and building up to the big finale and celebration on the eighth night. There are unique games and foods traditionally reserved for Hanukkah. Along the way, all are reminded that peace and good will applies in the celebration of Hanukkah as it does in the celebration of Christmas. The lighting of the menorah, known in Hebrew as the “hanukiya”, is the most important Hanukkah tradition. A menorah is a candle stand with nine branches. 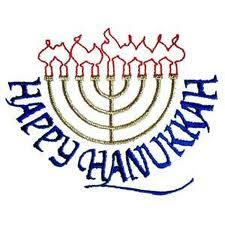 Usually, there are eight candles, one for each day of Hanukkah, that are grouped together or are of the same height. The ninth, which is a taller one in the middle or somehow otherwise distinguished from the eight, is called the “shamash” ("servant"), which is used to light the others. Each evening of Hanukkah, one more candle is lit with a special blessing. On the last night, all eight candles are burning along with the shamash, dinner is enjoyed with family and friends, games are played and then gifts exchanged.